An unjustly neglected figure in American political history, Henry A. Wallace (1888-1965) is usually remembered&#151;if at all&#151;in vague terms, as a hapless footnote to the 1948 national election between President Harry S. Truman and Thomas E. Dewey. As the Presidential candidate of the Progressive Party, Wallace was vilified as a third-party spoiler and a Communist dupe, charges that hung in the air for decades and contributed to his marginalized legacy. Two events during the 2000 election year conspired to restore Iowa native Henry Wallace to a degree of prominence. When Ralph Nader&#146;s Green Party candidacy briefly flickered to life with press coverage and polling momentum, statistically-minded journalists were quick to inform us that Nader had mounted the first significant left-wing third-party Presidential bid since Wallace&#146;s 1948 campaign. (Nader would ironically come to be maligned in a manner sadly like the treatment afforded Wallace and both men ended up capturing similar electoral percentages: 2.4 percent for Wallace and 2.7 percent for Nader.) 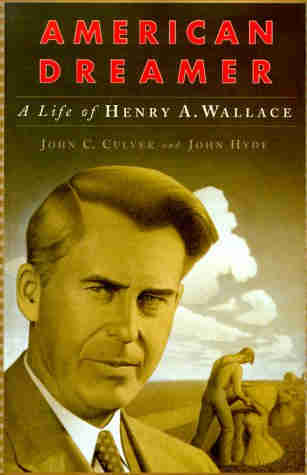 But the milestone that truly marked 2000 as the &#147;Year of Henry Wallace&#148; was the triumphant publication of John C. Culver and John Hyde&#146;s majestic biography, American Dreamer: A Life of Henry A. Wallace. Ten years in the writing, American Dreamer recounts in vivid detail the full breadth of Wallace&#146;s accomplishments, particularly his key role as Franklin Delano Roosevelt&#146;s crusading Secretary of Agriculture for seven years (1933-40) during the depths of the Depression. He later also served one term as Roosevelt&#146;s Vice President, and another as Secretary of Commerce. The phrase &#147;reinventing government&#148; has become an empty slogan in recent times, but FDR&#146;s New Deal was a breathtaking experiment in social democratic reform. Although it&#146;s generally accepted today that the New Deal&#146;s achievements were modest (the Second World War, not the New Deal, was the spark that rekindled the U.S. economy), the first two years of FDR&#146;s initial term in office were unprecedented in the scope of legislative remedies sought and enacted. Under Wallace the department&#146;s research center… became the largest and most varied scientific agricultural station in the world… The department&#146;s scientists combated plant and animal diseases and pests, from grasshoppers and chinch bugs to brucellosis and Dutch elm disease… Over fifty varieties of wheat were developed at the department during the 1930s. Thatcher wheat, which didn&#146;t exist when Wallace came into office, was growing on 14.5 million acres in the United States and Canada when he left. An endlessly curious part-time scientist himself, Wallace was one of the inventors of hybrid seed corn. In 1926 he founded the Hi-Bred Corn Company, which later became Pioneer Hi-Bred and made Wallace&#146;s wife and heirs enormously wealthy after his death (the company was purchased by Du Pont in the 1990s for nearly ten billion dollars). American Dreamer wouldn&#146;t qualify as a state-of-the-art political biography without a scandal or character flaw to exploit, and the authors have happily complied. Wallace&#146;s &#147;dark side,&#148; however, was endearingly kooky. A lifelong fascination with mysticism and the occult appears to have made him an easy mark for charlatans, among them a faux-Indian medicine man and opera composer named Charles Roos, who was given to addressing Wallace as &#147;Poo-Yaw&#148; and &#147;Chief Cornplanter.&#148; Wallace considered Roos a soul-mate. In the 1930s the two men purchased a tract of land together near Taylor Falls, Minnesota intended for spiritual retreats where they could, in Wallace&#146;s words, &#147;find the religious key note of the new age.&#148; More politically damaging was his friendship and correspondence with an expatriate Russian artist and &#147;guru&#148;&#151;complete with bald head and Fu Manchu mustache&#151;named Nicholas Roerich. Wallace eventually gave Roerich a Department of Agriculture expense account and sent him on a $75,000 expedition to Central Asia in search of drought resistant grasses. The raucous story of Roerich&#146;s fleecing of Wallace and the U.S. government is straight out of a Preston Sturges comedy and is one of the many highlights of American Dreamer. Regrettably for Wallace, a cache of the nutty letters he penned to Roerich was made public and unquestionably tarnished his reputation. Critic Dwight Macdonald famously dismissed Wallace as a &#147;corn-fed mystic&#148; during the 1948 Presidential campaign. Wallace&#146;s Progressive Party run for the Presidency was plagued by mishaps and blunders (not to mention the familiar criticism that Progressives were destroying the Democratic Party and helping to elect a reactionary Republican.) But there were heroics, too. On his campaign tour of the American South, Wallace became the first Presidential candidate to refuse speaking engagements before segregated crowds; nor would he stay in segregated hotels or eat in segregated restaurants. Threats of violence forced some of his speeches to be canceled. One of Wallace&#146;s supporters was stabbed. Only once did his public composure give way to anger: after being pelted yet again with eggs during a heated demonstration in Burlington, North Carolina, Wallace grabbed a bystander and shouted at him, &#147;Are you an American? Am I in America?&#148; Thanks to this impressive and indispensable biography, Henry Wallace&#146;s remarkable life is at last securely woven into the fabric of our country&#146;s troubled twentieth century history.